In March of 1949, a healthy baby boy named Richard Noe entered this world. Thirty-one days later, he left it — found dead in his parents’ bedroom in a working-class Philadelphia neighborhood. Over the next nineteen years, all nine of Marie and Arthur Noe’s other children would die — one stillborn, one in the hospital, and the other seven of unexplained causes–none lived longer than fifteen months. Gaining national sympathy for their unbelievabloe bad luck, the Noes were deemed victims of SIDS (Sudden Infant Death Syndrome). But as the years went on, may people found their SIDS defence a hard pill to swallow — after all, SIDS is not a hereditary condition. As investigators proved, they found that in each case, the child had died while home alone with Marie Noe. Finally, in 1999 — fifty years after her first child died — septuagenarian Maried Noe pled guilty to killing eight of her ten dead children. Today, she remains at home on probation helping psychiatric experts understand what is perhaps one of the most disturbing and baffling mysteries of all: how and why a mother could kill her own children. 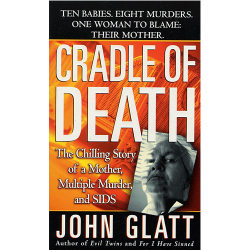 In this riveting true crime account, author John Glatt goes behind the headlines and into the heart of this fascinating case to reveal the shocking answers.